PT Multi Terminal Indonesia - MTI or later known as "IPC Logistic Services or IPC Multi Terminal" is a subsidiary company of PT Pelabuhan Indonesia II (Persero) with principal business in port logistic services. PT Pelabuhan Indonesia II (Persero) or most commonly known as Indonesian Port Corporation/IPC Group, which owns 99% of IPC Multi Terminal’s issued share capital, is one the largest state-owned port services operator in Indonesia and is a wholly-owned by the Government of Indonesia. Other 1% remaining IPC Multi Terminal’s issued share capital was owned by Maritime Employees Association (KOPEGMAR). 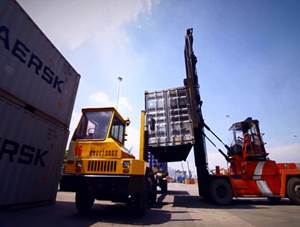 Headquartered in Jakarta, IPC Multi Terminal has strong business focus in three sectors: multi purpose terminal, container terminal and freight forwarding. According to PC Multi Terminal's company profile as cited by JobsCDC.com, IPC Multi Terminal was officially formed in 2002 as a spin-off results of the Terminal Business Division (DUT) of the Port Tanjung Priok branch. IPC Multi Terminal runs its business 6 branch offices throughout Indonesia; Jakarta Branch, Surabaya Branch, Banten Branch, Cirebon Branch and Semarang Branch. IPC Multi Terminal’s head office is located at Jl Pulau Payung No 1 Tanjung Priok Jakarta 14310. Minimum Bachelor (S1) holder in Law (Business Law, Corporate Law). Must be fluent in English written and oral. Required experience for minimum 8 years in Corporate Legal/Law and familiar with Logistic Industry. Required experience for minimum 5 years in managerial position, preferably Manager specializing in Legal/Corporate Law . Strong understanding in handling procurement. Strong interpersonal, analytical, time management and leadership skills. Minimum Diploma holder, preferably from Marine Polythecnic. Required experience for minimum 5 years in managing Depo Empty (MT) Container. Required experience as a Marketing in Shipping Company. Strong knowledge in handling Depo MT Container such as Logistic Distribution, Storage Fumigation, Cleaning, Repairing and Marketing Depo Empty (MT) Container. Minimum Bachelor (S1) holder, preferably majoring in Mechanical Engineering. Required experience for minimum 4-5 years in similar position. Strong knowlede in heavy equipment and transportation areas. Previous experience in controlling and repairing heavy equipment and transportation. Able to work independently as well as work together. Strong presentation and good report writting skills. Fluent in English written and oral. JobsCDC.com now available on android device. Download now on Google Play here. Please be aware of recruitment fraud. The entire stage of this selection process is free of charge. PT Multi Terminal Indonesia - Head, General Manager, Senior Manager IPC Group July 2016 will never ask for fees or upfront payments for any purposes during the recruitment process such as transportation and accommodation.